Having your hands wet for a long time or having them frequently wet during the day can irritate your skin leading to dermatitis. Some ingredients in cleaning products can cause skin allergies and asthma. 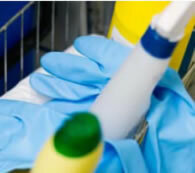 Some cleaning products are corrosive and can cause skin burns and eye damage. Use good work techniques that avoid or minimise contact with harmful substances and minimise leaks and spills. Store cleaning products safely. Practice good hand care – remove contamination promptly, wash hands properly, dry thoroughly and use skin creams regularly. The controls you need will depend on the task. Click the links below for more specific information. SR24 Storing chemical products (small scale). SR4 Manual cleaning and disinfecting surfaces. SR1 Cleaning & disinfection with low pressure washers.